It’s more traditional, but also more refined than past Surfaces. Microsoft has tried hard to reshape what a notebook could be over the past few years. But, it turns out, not everyone wants a computer that can double as a tablet. So with its latest device, the Surface Laptop, Microsoft is completely embracing the notion of a traditional notebook. There aren't any gimmicky features this time around -- like the Surface's Type Cover and kickstand, or the Surface Book's detachable display. But Microsoft didn't need one. It's a very nice laptop! That's the gist of it. The Surface Laptop is basically Microsoft's direct competitor to the MacBook Air and lower-end MacBook Pros. It's thin and incredibly light — but then, so are plenty of ultraportables these days. What makes it special are Microsoft's many other design touches. The case is made out of smooth metal that simply feels great. It's a well-balanced and solid-feeling machine all around. And the keyboard area is draped in Alcantara, a comfortable cloth-like material commonly seen in cars, which makes it ideal for your wrists. Speaking of the keyboard, it feels similar to the Surface Book's, but it's even easier to type on. The large trackpad is also one of the smoothest I've seen on a Windows PC. I didn't have much time to stress the Surface Laptop, but it had no problem juggling a few web pages and loading up a 4K YouTube video. That, by the way, made the Laptop's 13.5-inch screen shine. It's bright and colorful, just like the displays on its Surface siblings. My main takeaway: I loved touching and holding the Surface Laptop. And I can't wait to do it again. I only wish Microsoft had done away with the proprietary Surface power connection and went with USB-C instead. Port-wise, you only get one USB 3.0 port and a mini DisplayPort connection. There's no card reader slot either, so you'll have to get used to carrying a hub around if you use multiple accessories. A single USB-C port would have at least given you a simple way to charge it. 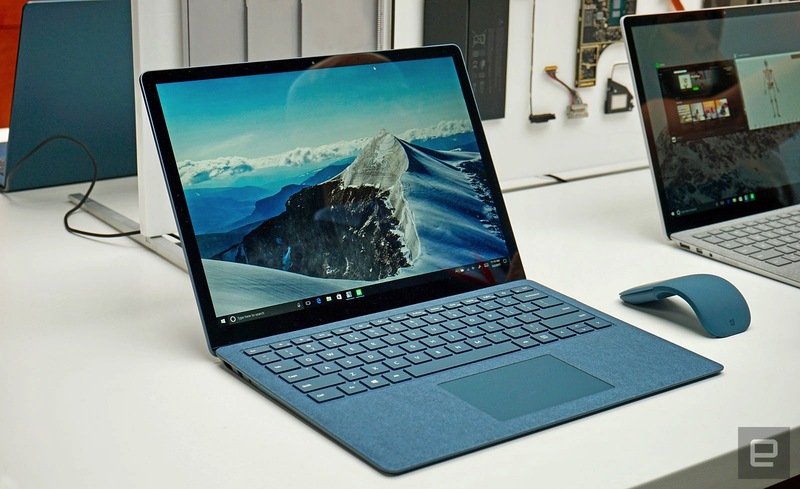 The Surface Laptop is also Microsoft's flagship Windows 10 S device, its stripped down operating system meant for schools. In my brief hands on time, it felt like typical Windows, except without the ability to run legacy apps. But unlike Windows RT, Microsoft's ill-fated ARM operating system on the original Surface and Surface 2, Windows 10 S can easily be upgraded to support any app. Surface Laptop owners will be able to upgrade their devices for free this year, and for $49 afterwards, from the Windows Store. While I loved the Surface Pro 4 and Surface Book, each of them came with their own compromises. The Surface Laptop feels like, well, pure laptop. It's a machine you can easily flip up and start working anywhere. And with an expected 14.5 hours of battery life, it should last you well beyond the work or school day. (Yes, we'll definitely be testing that.) Mostly, I'm impressed that Microsoft managed to wow this jaded tech reporter with what's basically just a notebook. But what a notebook.